So, you are now looking for a nice affordable SLR camera for some serious photography. There are many SLR cameras available on the market. However, if you are looking for something more affordable and budget-friendly, you may have put a special attention to Nikon FM10. It is an SLR camera that uses the 35 mm film format, offering the great power of manual control and versatile lens compatibility. So, is Nikon FM10 really the money? Nikon FM10 supports multiple exposures. The EV range is from EV 2 up to EV 19 at ISO 100. Meanwhile, the ISO range is 25 – 3200, and the shutter speed is adjustable between 1 – 1/2000th second. Nikon FM10 comes with manual focus, and all the settings are adjustable manually. The camera will give you the fullest extend of control over your images. Nikon FM10 has a fixed eye-level viewfinder and a fixed focusing screen with split image microprism and matte field. In the right hands, Nikon FM10 can produce excellent images. The brightness levels are great. The images can be very sharp and crisp and detailed. Another advantage of Nikon FM10 is the wide range of compatibility. Nikon FM10 comes with an all-metal Nikon F Lens Mount. Thanks to the metal material, the lens mount is quite durable. It can work with all Nikkor AF-D, AF-I, AF-S, AI-P, and AI-S lenses. Therefore, you can be very versatile and creative with your camera and lenses to shoot different challenges in different conditions. Weight (without batteries): 14.7 oz. Self Timer: Mechanical self-timer, approximately 10 seconds release delay. 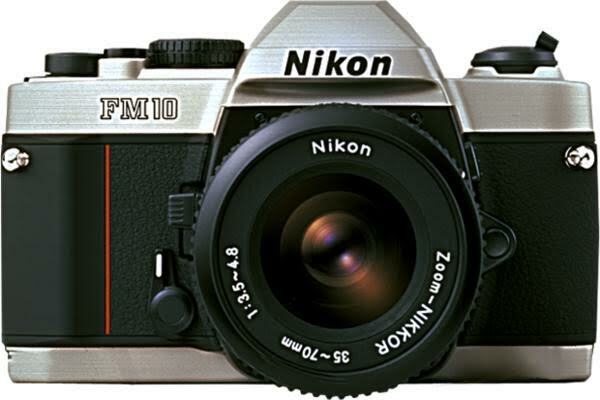 Check the best price of Nikon FM10 here!